Sunmasters blatantly lie to you! Booked with Sunmasters and was told you can use 3 hotels in the complex and seven pools, when there are only 2 hotels you can use and 4 pools. Asked if I wanted a sea view when my hotel was up the road from the hotels they advertise on their Web site, got dropped off at the wrong hotel didn't get picked up at all for the return and then had to book my own taxi at a cost off 80 euros when I had already paid them for transfers. Our advice - book a private transfer, cuts 1 1/2hrs off transfer time! Check in was fine although staff looked as though they couldn't be bothered. Were briefly shown to our room which was stifling hot, no air con and the fans that were in the rooms were noisy but if you beat them they did quieten down enough to get to sleep. Had to sleep with the balcony doors open all night but still woke up in pools of sweat! If you want a so called '2 bedroom' room then I wouldn't exactly call it that, no doors on the rooms just an open plan apartment with no privacy to get dressed. Children and adults may as well be sleeping in the same room! If you did want privacy to get dressed you would have to use the sauna of a bathroom which then meant you would need another shower! Nowhere in the children's bedroom to put clothes so lived out of a crumpled suitcase all week! Balmoral apartments very tired and run down...view from balcony of a massive overgrown oak tree...GREAT! The reception staff are rude and once you are there will not do anything to help you whatsoever!!! Should you have a night flight like us then the hotel has no secure area to keep your luggage after check out which is 12pm. After an altercation with said manager again and many crossed words he decided to let us keep our room longer(normally a charge of 35 euros) money, money, money to this man! No security to be seen at this hotel apart from at the pool between 4-8 when most people are packing up to get ready for tea! The bar - only allowed 2 items at a time and that’s ok if you are their just as a couple, if you have children it is a whole different story! An adult has to go up endless times to get everyone in your party what they need in the never ending queue! Bar staff 50/50, pot luck if you get a happy one or a grumpy one who literally throws it at you. Bar closes at 12am prompt and god forbid should after that time you just need water! The good points - the food was OK, the usual for a 3 star. All needs catered for and you won't starve for a week, the air con in the restaurant was welcome, however food very salty and the chef does tend to sweat on the grill. Pools warm and clean, the nearby beach was fantastic, best day that we had. Small town of shops and bars which was only a short walk away. Entertainment was lively and they put a lot of effort into the shows. All in all, I would never stay here again due to the manager and staff attitudes. May they be stung by the thousands of wasps and fall down all the slippery steps. This was our honest experience and the choice is yours! Me and my Fiancee stayed at this hotel for 10 nights all inclusive during the school holidays. It is set in a complex with two other hotels within close proximity. The other two hotels were the mastines and chihuahas. We first arrived and was taken the chihahuas hotel to book in, we were then driven round to the Balmoral hotel which was probably the smallest of the three hotels but it was still a good sized hotel. Our room was located on the third floor which was accesible by lifts or stairs. The room we were put in had 2 single beds and a balcony with a clean bathroom, air onditioning and was a good size for two people with a view of the island but also part of the sea. Along the corridoor outside our room was a water feature that stretched the whole lenght of the corridoor over the three floors. All meals were served buffet style with fresh apple, orange jucies, tea, coffee, etc all available. The food was spread out over three sides of the restaurant and was constantly full with a wide range of food at breakfast time from, eggs, bacon, sausage, to fresh fruit and bread. During lunch and dinner there was ussually different types of meat and fish available that was cooked in front of you by the chefs, which was excellent to see. There was also plenty of salads and pastas and vegetarian options available. This is all without talking about the desserts which were just delicious :-P with donuts, ice creams, cake, biscuits all available. Throughout the day between meal times the snack bar was constantly open for chips, burgers, pizzas, etc. Throughout the day you are allowed to use all of the facilities from the other two hotels within the complex, it was just at meal times you had to eat at your designated hotel. Me and my fiancee decided to spend all of our time around the pool at the Chihauhas hotel as we found this to be the largest with the most amount of sunbeds available. This also had an excellent view out to sea that was beautiful to see throughout the morning and afternoon. Our rooms were constantly cleaned and fresh towels and toiletries were brought to our room 6 times a week. All of the staff at the hotel were very helpfull with any quieries or questions that we had for them. While i was at the Balmoral hotel it was my birthday and the housekeepers knocked on our room and gave me a card and a bottle of wine which i thought was a really nice gesture. Overall our stay at the complex was a really enjoyable one with the best all inclusive food and drink that i have been to so far and i would certainly consider returning to this hotel again in the future. Arrived at hotel around midday and were taken straight to the Chihuahuas, where the only reception is. Allocated room in the Balmoral and were bussed up to it by hotel's own minibus - a nice touch. Room OK, if a little small and we had no TV (have previously stayed in Sol hotels and had TV, so this was a surprise. Food was fine with enough choice for this fussy eater - desserts sublime!! Pool area a little crowded, but we saw none of the normal morning sunbed dash. Indeed, waited one morning for about 20 mins while the poolside was jetwashed..
Entertainment for the whole Sol complex seemed to centre on our hotel as it had the only outside stage. With early diners from the other hotels making their way up to the Balmoral for the evening, getting a table was always a major challenge and the bar staff were kept pretty busy. Perhaps the load could have been spread a little better or a stage constructed in the Mastines grounds - plenty room there! 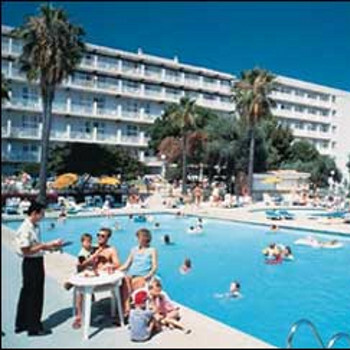 The hotel is part of complex call Sol Calas de Mallorca. The Balmoral is the smallest and least well-appointed of the three but still a decent enough holiday resort hotel. It is medium size by Spanish resort standards. Guests are allocated to a hotel on arrival - as far as I know you can't specify in advance which you would prefer. The Sol Chihuahas (where you check in) looks to be the best (judging from the public areas) and also the biggest. The Sol Mastines was similar but slightly smaller. You have to eat at the Hotel your are booked into but you can use all the facilities at any of the hotels. All meals were self-service from a buffet that took up 3 sides of the dining room. The food at the Balmoral was excellent. Lots of choice and always some dishes being cooked in front of you. Well worth 5 stars - for this kind of eatery. The hotel design includes lots of little flights of stairs between different areas so not really suitable for the infirm - although there were two people on mobilty scooters who were managing to zoom around using the circuitious ramps. The only access to the dining room though is by steps or a stairlift. Most of the hotel (including our bedroom) was spotless but the small public toilets between the bar and the restaurant were a bit grubby and untidy though not really dirty or smelly. Not surprising given the small size and the large number of people using them. The main entertainment for all 3 hotels took place on the outside stage at the Balmoral and there wasn't really enough room for everyone. Some nights there were live singer/keyboard players in the Piano Bar at the Mastines who were very good for easy-listening but overall the Entertainment was slightly disappointing. The staff were excellent, the bar staff always greeted you with a smile even when they were rushed off their feet. We were on all-inclusive which is an amazing bargain. The downside being that drinks were served in a throwaway plastic cup (except wine at mealtimes). The hotel overlooks a lovely small cove, Cala Antena, with a nice sandy beach. Unfortunately it's a long way down steep steps to reach it so make sure you've got everything you need before you set off! About halfway down you can access a cliff-side promenade that goes all the way round to the beaches at the opposite end of the resort. The easiest way up and down to the promenade (we discovered eventually) is through the grounds of the Mastines hotel. There are plenty of buses that leave from outside the Mastines to various parts of the Island, some go every day, some only one day a week (usually coinciding with a market. I would certainly consider this complex again if I wanted to stay on that side of the island. On first arrival we thought well its not that bad. However, the food was repetitive and bland. We were all inclusive and felt it necessary to eat at local restaurants 3 evenings. We were lucky we hadnt taken our 4 kids as there wasnt any food specifically for kids. The rules of the snack bar meant you had to eat and drink inside which was a bit of a pain but we lived with it. Vegetarian food was thin on the ground too unless you want salad and chips! The bread was amazing so well done!!! The rooms are very small, claen towels daily and sufficent cleaning. We avoided the pool, again glad we hadnt taken the kids, as it was very very dirty on the floor around it. They never cleaned up during the day and it felt like it needed jet washing. Its location is beautiful and we had an amazing view of the sea but we didnt get sun after 10am on the balcony but hey you cant have everything. The bar was understaffed. There was always a queue of 7/8 people in the day and alot more in the evening. Again the entertainment wasnt our thing so we nipped to the local town. very clean hotel.reception staff very polite.restaurant staff nice but never smiled. entertainment great for kids but not so much for adults. food good but after first week we got a bit tired of pork,chicken and fish. overall a good family hotel. Hotel very popular with families with children. Animation team caters mainly for children. Indoor dance floor doubles as stage and children tend to dominate. They put on some good shows of their own with audience participation. Some visiting entertainers seemed to be acrobatic type acts. Maid service very good.Would clean room every day and change towels if required. Food quite good though repetitive. Especially spag. bol. twice every day! There was always something to chose though.Good salad bar and dessert area, though desserts were always the same. Hotel needs refurb. Fabric on some chairs in lounge needed a good clean. Lots of dining room chairs had dents in them where they were bashed against the tables when cleaning carried out, presumably. Local drinks on tap some not so nice. Did not like having to drink out of plastic cups all the time except when in restaurant. Even tea and coffee served in plastic mini cup with no saucer, not nice at all. Staff friendly if you may the effort with them. Only hotel I have ever been offered a drink by reception on arrival. Beach not too far. Town 5-10 mins. walk away. Small town centre with very noisy karaoke bars some next door to each over drowning each other out. Too loud. No tv sets in rooms and tv lounge doubled as indoor smoking room. Very smelly to walk past to access lifts to rooms. We had a great time. Towels changed every day. Food was fantastic. If you could find nothing to suite you in this hotel food wise there was something wrong with you. We would recomend this hotel to anyone. We saw them testing the pools three times a day. We had booked through Fleetway Travel from the teletext pages and would definately go with them again. Great holiday. Only draw back sunshine on 2 days. The hotel was very clean,it has 3 pools 2 large ones and a small one for the children,sun beds are in ubundence the food was great fresh cooked eggs in the morning, any way you like them the choice of any other breakfast thing you can think of, lunch was great, loads to choose, from salads, fresh cooked fresh caught fish, several tipes of meat, veg, 10 or more differnt sweets plus fruit. Dinner was the same but more choices. The entertianment team were very good and worked very hard all day and night, infact all the staff from the cleaners to the reception and bar staff were very polite and friendly. The only drawback for me was the fact that the beach was about 15 minutes walk away there is a closer one but its not very clean or organised and big rocks just under the water that makes it hard to get in the water and harder to get out, there is a little train that will take you to the beach that stops outside the hotel.the rest of the town is small a few bars and shops and restraunts. There is not a lot to do for children unless they just like to stay by the pool. We had a great time and enjoyed it very mutch there.